A woman attacking praying Muslims and a shop owner being beaten are just some of the anti-Islamic attacks that have occurred in the US since the shootings in San Bernardino, California. On Sunday a woman attacked Muslims with anti-Islamic slurs and then hot coffee when she saw them praying in a park. Rasheed Albershari captured the footage of his friends confronted by the woman at Lake Chabot in Alameda County, according to Arab American News. When Albershari says she insulted his god, the woman hits him with her umbrella and tosses her hot coffee in his face. In another incident this week a Muslim store owner in Queens, New York, was also attacked over the weekend by a man who said he wanted to “kill Muslims." 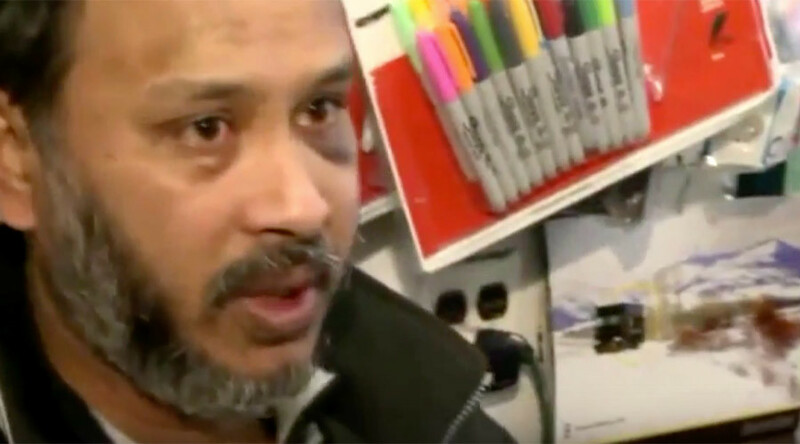 Sarker Haque teared up as he told WPIX about how the customer punched him repeatedly until a passer-by stopped the assault. Police identified the attacker as Piro Kolvani and are investigating the incident as a hate crime. “It doesn’t matter what color or nationality you are. We are in America. Everybody came from somewhere,” said Haque. Shortly after the Paris attacks a Muslim sixth grader was attacked by three classmates at her New York middle school. “Since August of last year… we’ve seen a cycle of Islamophobia that’s had a much more violent tinge to it than we’ve seen in many, many years. I would’ve argued that it was calming down, until Paris followed by San Bernardino,” said Corey Saylor, spokesperson for the Council on American-Islamic Relations. Samer Shalaby, a civil engineer from Virginia, was harassed during a Spotsylvania County community meeting he called to propose plans to replace the town’s aging Islamic center. The meeting was cancelled after the crowd became hostile, with one member reportedly shouting “Nobody wants your evil cult in this town!”. According to U.S. News and World report from February this year, there has been over 300 American deaths from political violence and mass shootings since 9/11, and only 33 of them have come from Muslim-Americans. “Islamophobia is the accepted form of racism in America,” said human rights lawyer and author, Arsalan Iftikhar, in the Islamic Monthly. A sentiment that appeared to be backed up by presidential candidate Donald Trump’s suggestion that all Muslims should be banned from entering the country. Many Muslims say Americans, and Europeans, often don’t differentiate between radical Islamic militants and the religion of Islam. Just a few of the most recent anti-Islamic attacks show the confusion in full effect.